Instagram stories vs the grid - What and when to post. I've been getting the question from business owners a lot lately: what do I post on my grid vs what do I post on my instagram stories? What is the purpose of each? Here's my take on it currently: Your instagram grid is for the polished, 'beautiful' version of your life and business. Whereas your stories are for the messier, 'behind the scenes' content. Why? The instagram grid is the traditional instagram content that we are all familiar with. It has a longer shelf-life than instagram stories do and will stay on your grid (or profile) indefinitely. For this reason, I recommend you put more effort and strategy into the content you post on your grid. Make sure it's on-brand (no random Pinterest quote graphics please!) in your colours and fonts. Keep the photography high quality and plan out your grid so it all looks fab and cohesive. How often to post? Because we are seeing good quality posts on the instagram feed appear for 2 -3 days, the strategy I currently recommend is a good quality post (put some effort into it!) every 3 days. I used to recommend people post on the daily, but times have changed in terms of the algorithm and what people are seeing. So, if you can aim to get 3 - 4 posts out a week, that's awesome! Why? With the introduction of insta stories - it has given businesses the opportunity to show the casual, 'real' side of their businesses. There's a definite movement towards authentic businesses created by real people and as small businesses, this is a key way to interact with your followers. If you have over 10k followers on instagram, you also have the ability to link out of instagram on your story (amazing!) so this trumps the whole 'link in bio' situation we have on the grid and feeds. 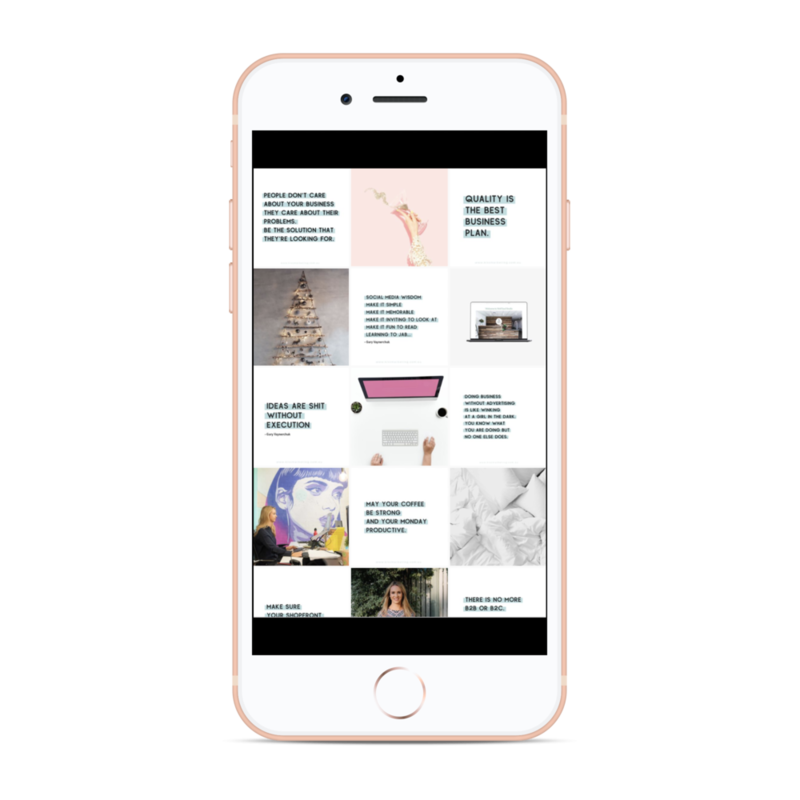 Because interaction with your story is 100% private between you and the follower, people are also more likely to send a message or respond to a question via stories than the grid posts. This is amazing for engagement and again, a great way to build a relationship with your audience. As you can tell, I'm basically in love with instagram stories! 5) Behind the scenes in your business - new product, services, finished work for other clients. Bonus points if you liven things up a little with gifs - they always draw the eye far more than a simple shot. For the best stories, make sure you add them as a highlight on your profile. I like to have a number of different categories so when people visit my profile they can get a feel for what I'm all about straight away. Go the extra mile and create story cover images that are line with your branding. How often to post? Well, since the stories disappear every 24 hours, I recommend you do one story at least every 23 hours ;) If you can always have one up there, this will stop you from dropping to the end of the queue and keep your loyal watchees watching! In all honesty, I'd rather you post regularly on insta stories over the grid if you can't do both. I’m finding for myself and a lot of my clients recently that the stories are being viewed and engaged with far more than the grid posts. Newer PostShould you be using hashtags on Facebook? Older PostFAQ: Should you invest in Facebook 'likes' i.e. followers before other campaign objectives on Facebook?